I love dollar store crafts, and pool noodles from the dollar store are among my favorite dollar store crafting materials. Pool noodles are fun, inexpensive, and versatile, and today I am sharing some of my favorite pool noodle craft ideas and tutorials. 1) Lightsabres - My boys are huge Star Wars fans, so it is no surprise that these super-cute pool noodle lightsabres continue to be a huge source of entertainment in my house. 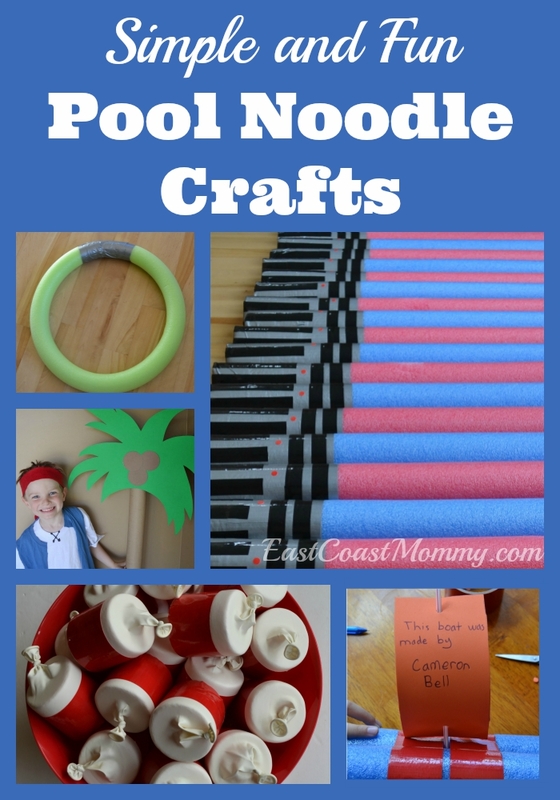 To make them, you just need: pool noodles, duct tape, electrical tape, stickers, and the tutorial that you can find here. 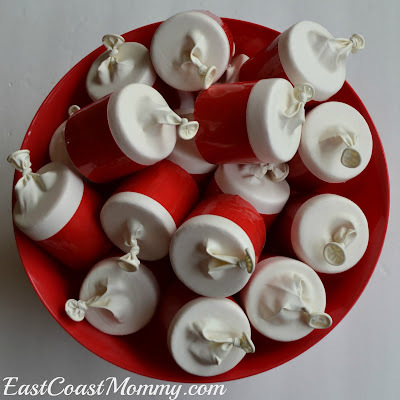 2) Poppers - These pool noodle poppers are easy to make and super-fun to play with. They also make fantastic prizes and party favours. Check out the full pom pom popper tutorial here. 3) Boats - My boys loved making these simple pool noodle boats. 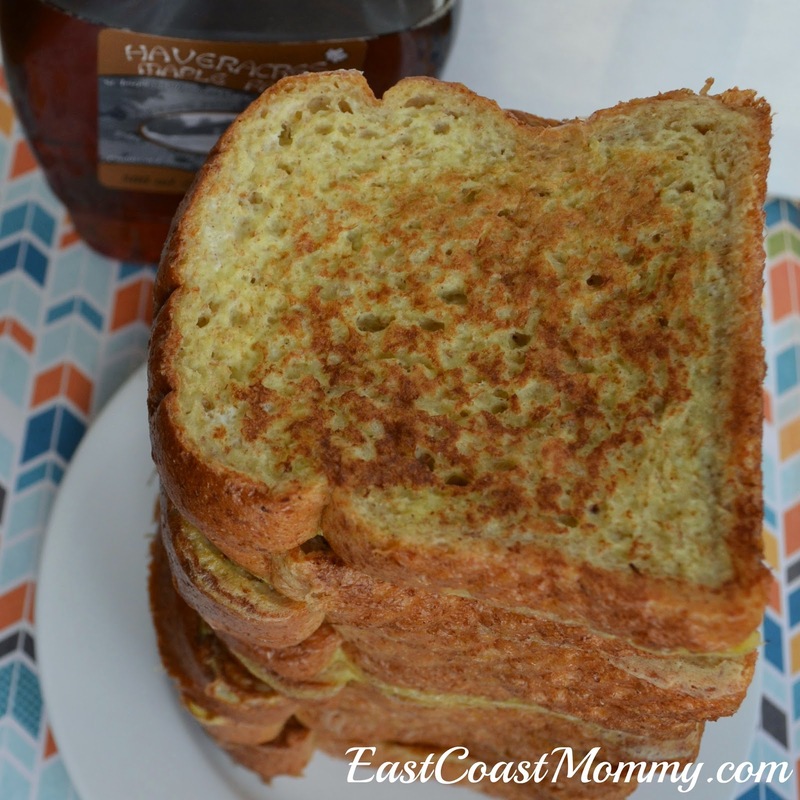 You can read about our boating adventure and get the full tutorial here. 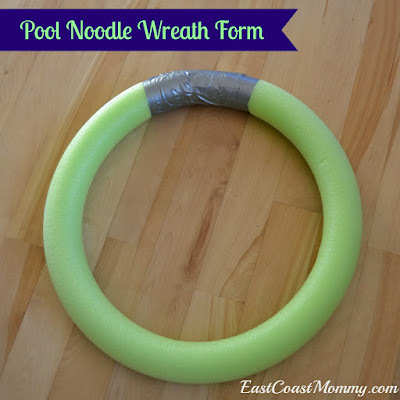 4) Wreaths - Pool noodles make fantastic and inexpensive wreath forms. You can find the tutorial for making a pool noodle wreath form here. 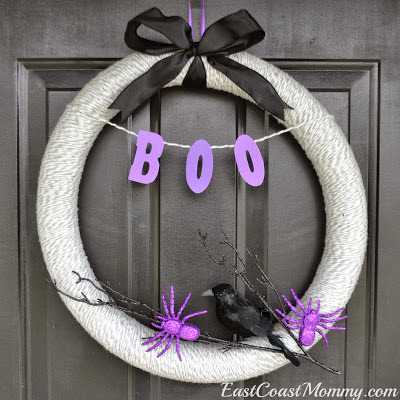 And you can find a tutorial for my Halloween pool noodle wreath here. 5) Holiday decor - Pool noodles provide great inspiration for holiday crafting. Pick up a bunch of pool noodles during the summer months so that you will have them on hand when needed. 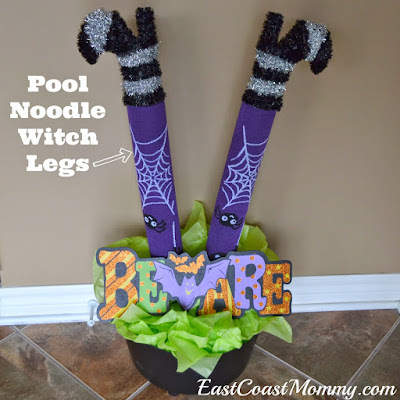 You can find the tutorial for my pool noodle witch legs here. 6) Party decor - DIY party decor can really make a party feel special, and pool noodles can be transformed into fantastic party props. 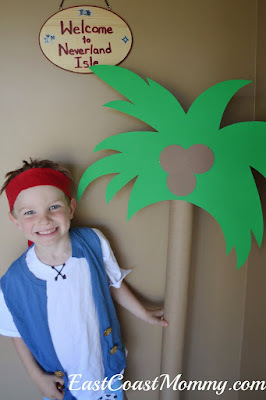 For example, I turned a pool noodle into a palm tree for my son's pirate party. You can find the full tutorial for my pool noodle palm tree here. Fun, right? I just love pool noodles. They really are one of my favorite crafting materials... and they are so inexpensive! Do you have a fantastic pool noodle creation? I'd love you to share it in the comments (below). 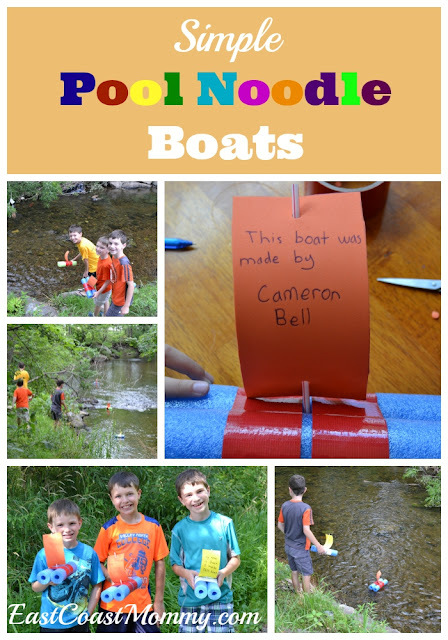 One of the items on our summer checklist this year was "craft a boat and float it down a river". It's a lot of fun for my boys to make boats, take them to the river, and see how week they sail. In the past, we have used popsicle sticks, paper and stuff from our recycling bin. This year, we made simple (and super cool) pool noodle boats. 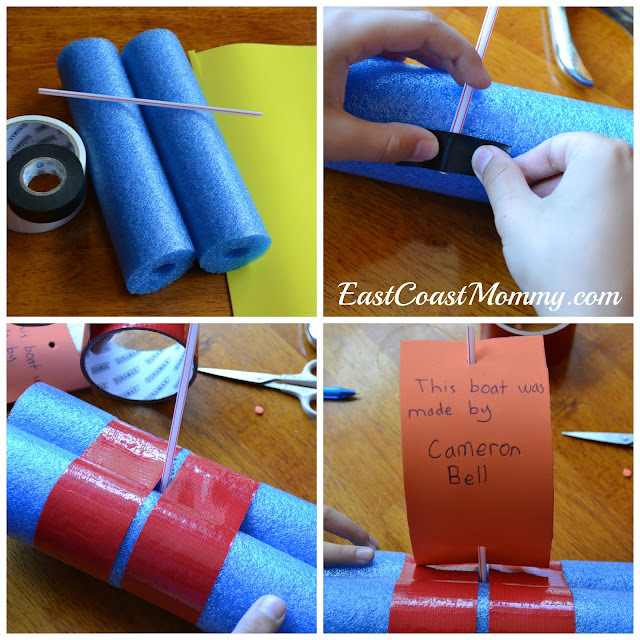 The boys loved their pool noodle boats because were waterproof and very buoyant, and I loved how simple they were to make. 1) Cut two equal-sized pieces from a pool noodle. I used a serrated knife. 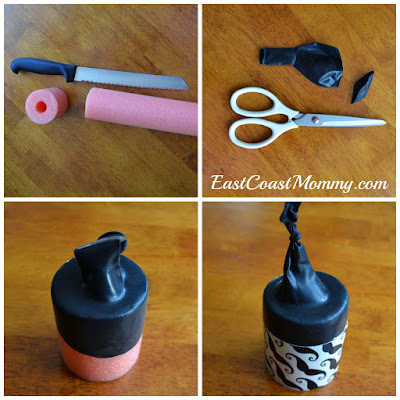 2) Use electrical tape to attach a straw to the middle of one of the pool noodles. 3) Use duct tape to attach the two pool noodles together. 4) Cut a sail from craft foam, decorate (if desired), and use a hole punch to attach it to the boat. 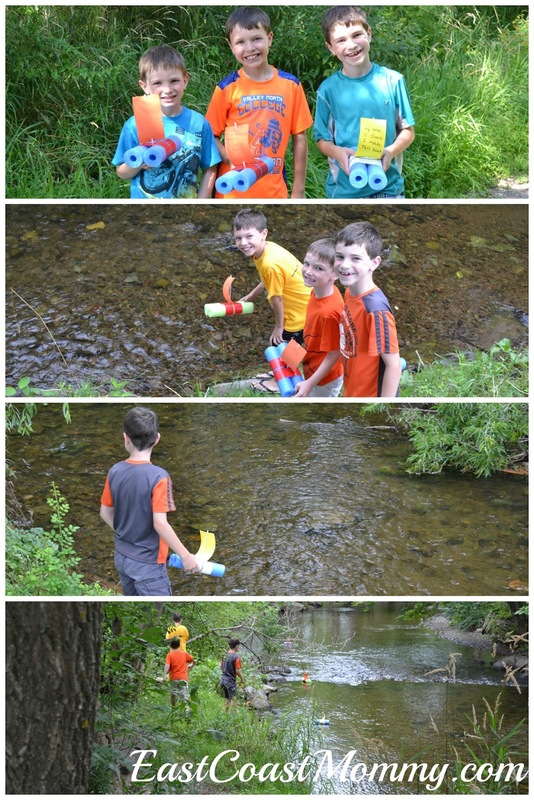 We took our pool noodle boats down to the river, and my boys had a fantastic time chasing them along the shore line. It was a fantastic way to spend some time outside with my boys. 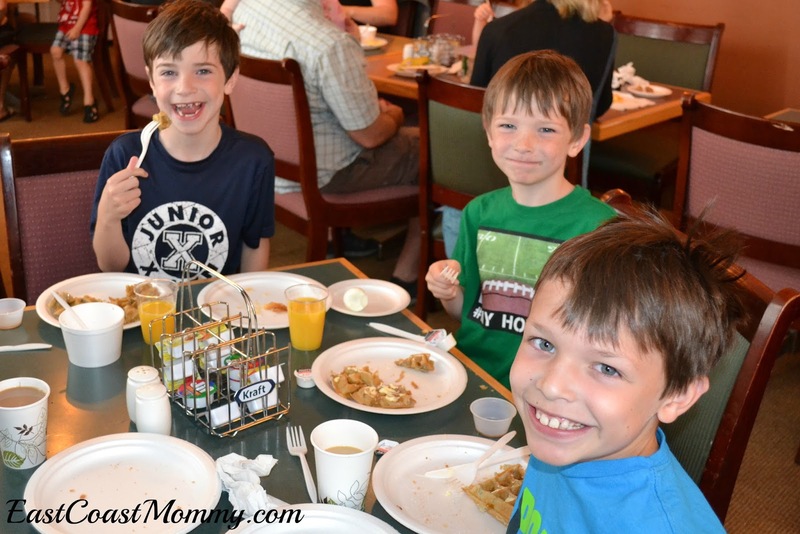 Each year has 195 school days, and I have three boys -- that's 585 school lunches each year. 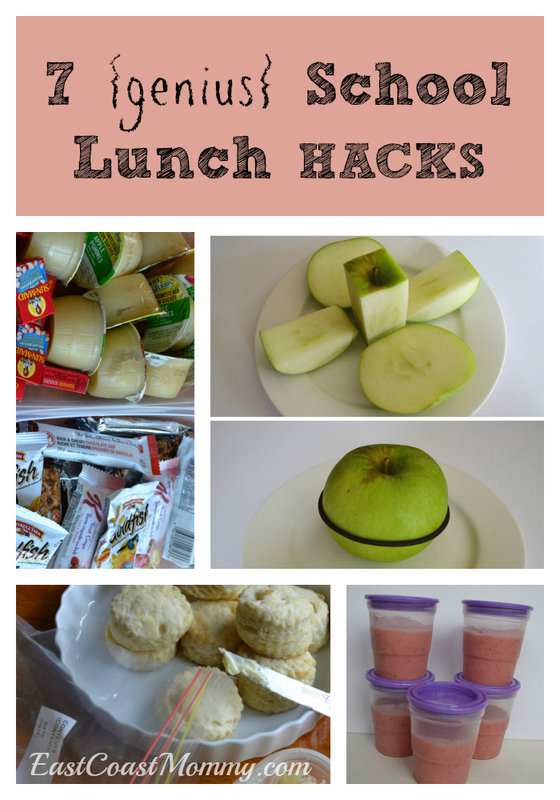 Making easy and nutritious lunches that kids will actually eat can be challenging, so today I am sharing some school lunch hacks that will help make the process a little less painful! 1) Breakfast for lunch - My boys aren't big sandwich eaters, so breakfast for lunch is a popular option in our house. I often make a big batch of French toast (made with whole wheat bread, eggs, milk and a touch of cinnamon) and freeze it. Then, I take a slice out of the freezer each morning, heat it up in my toaster oven, cut it up, and stick it in a thermos. Hard boiled eggs are fantastic too. Cereal is another simple “breakfast for lunch” option. I fill a thermos with a low-sugar cereal, and my boys add milk at lunchtime. With the addition of some fruits and vegetables, it’s a pretty nutritionally balanced meal. And dollar store dressing cups make perfect holders for a bit of maple syrup! 2) Stock the pantry and the freezer - I love to bake in large batches, wrap the items individually, and store them in the freezer. 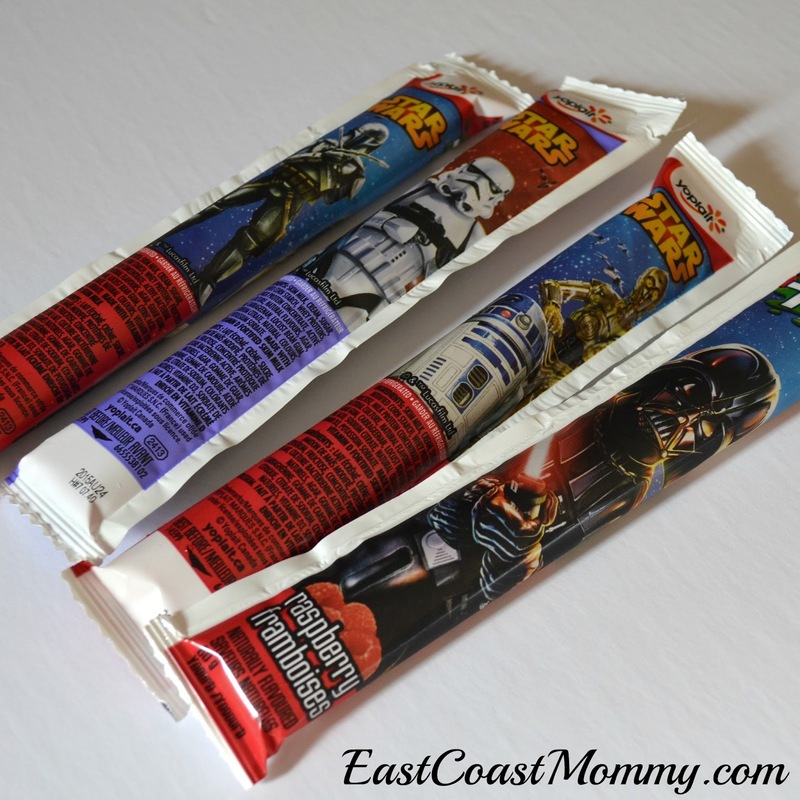 Then, each night, I just pull what I need from the freezer, and pop them in the lunch bags. 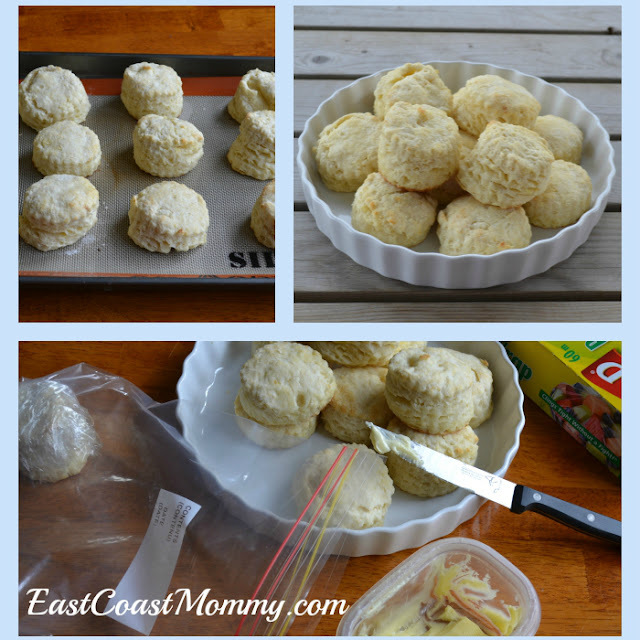 This method works great for biscuits, muffins, and cookies. A well-stocked pantry is also a must. I always buy lunch staples (like granola bars, raisins, unsweetened applesauce, etc…) in bulk when they are on sale. Then, I take them out of their original packaging and put them in plastic containers from the dollar store. This little trick helps save money, makes lunch items quicker to access, and frees up cupboard space. 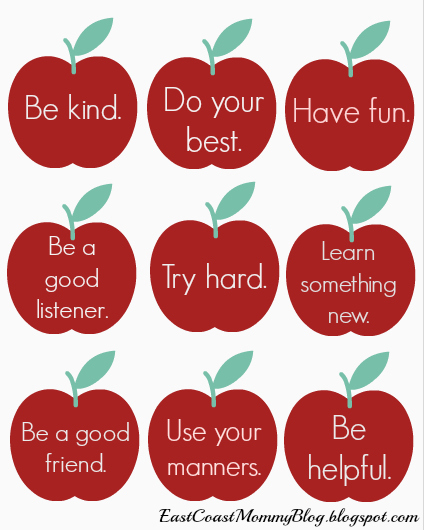 4) Apple trick - My middle son is missing some of his baby teeth, so he can only eat an apple if I cut it up for him... and he doesn't like when an apple starts to turn brown. 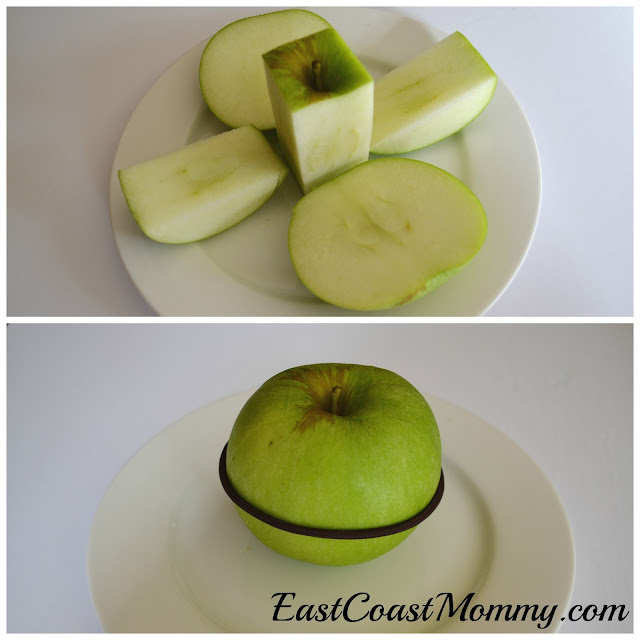 The solution: cut an apple, put it back together, and secure it with an elastic, and cover it with some plastic wrap (to keep the air out). 5) DIY ice packs - Frozen yogurt tubes are fun to eat, they keep lunches cool, and they thaw in time for lunch. A damp sponge in a Ziploc sandwich bag also makes an easy DIY ice pack that they can use to clean there hands after they eat. 7) Lunchbox biscuits - These biscuits are delicious, but the school lunch shortcut is even better. You can get the recipe and read all about my lunchbox biscuits HACK here. 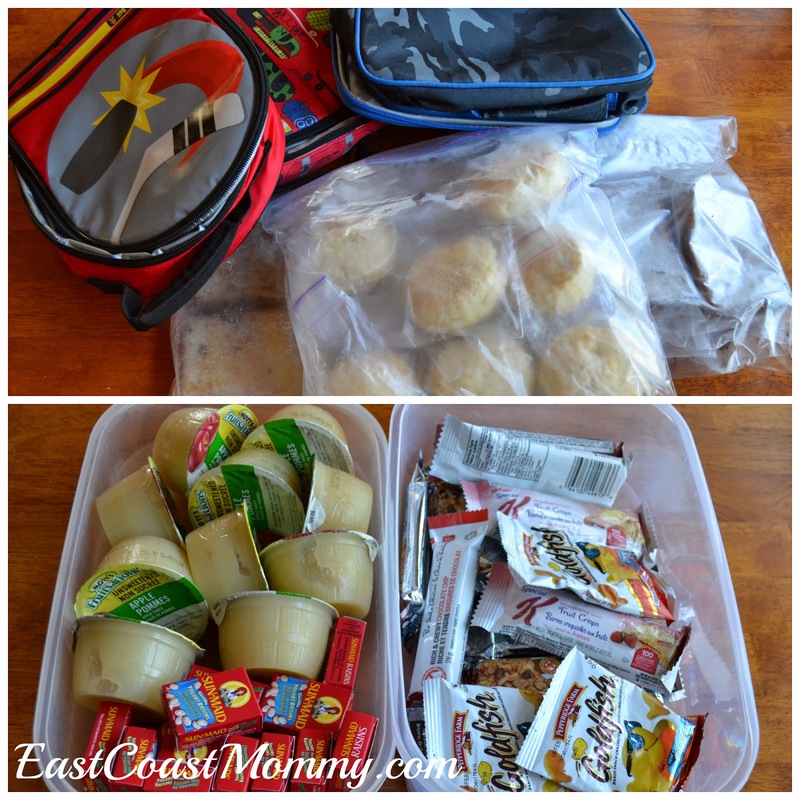 I hope these school lunch HACKS help make "back to school" a little less painful in your home. 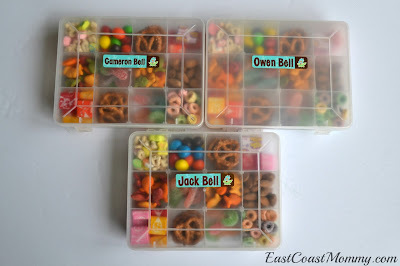 Do you have a school lunch HACK you'd like to share? I can use all the help I can get! 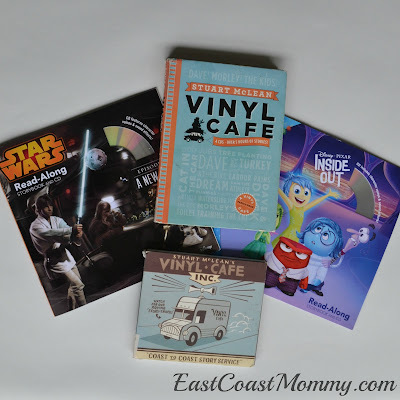 In the mood for something fun and easy that will entertain and educate your children? 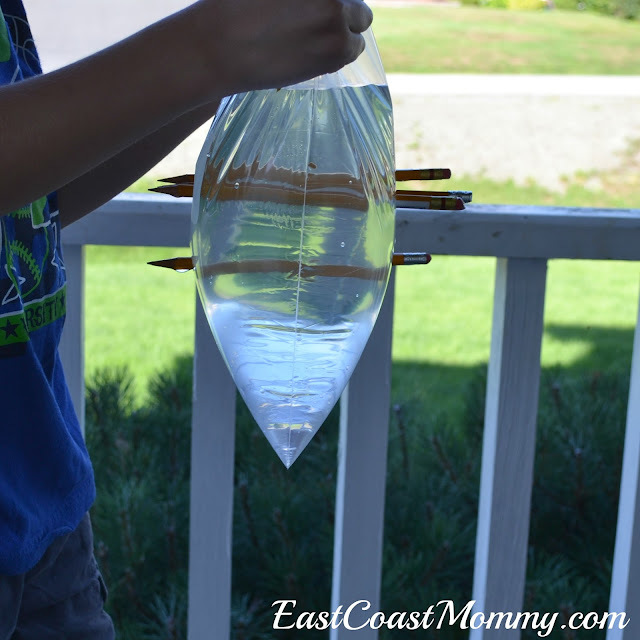 Check out this simple science experiment, which is perfect for a sunny summer afternoon. When my boys were finished, they pulled out the pencils and watched the water squirt out from the holes. It was a fantastic way to cool off on a warm afternoon. 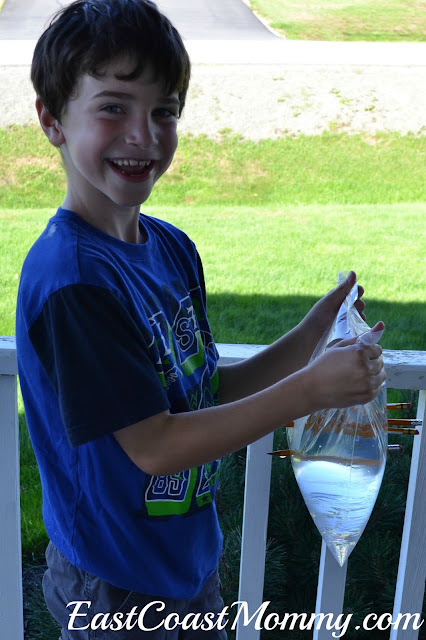 My boys had so much fun, that we decided to finish the day with another classic experiment. We filled a bottle 3/4 full of vinegar, added some baking soda, and quickly capped the bottle with a balloon. 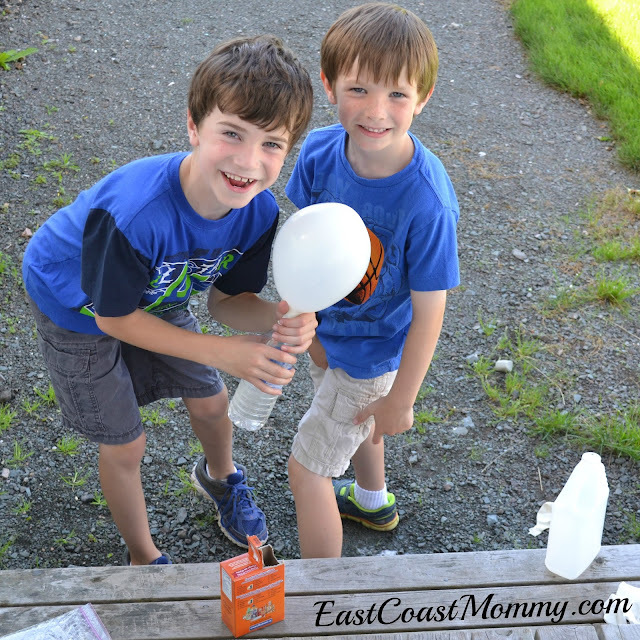 My boys loved watching the baking soda/vinegar reaction blow up the balloon. I love a simple science experiment, don't you? We might have to squeeze in a few more before the boys head back to school. This summer, our family did something we have never done before. 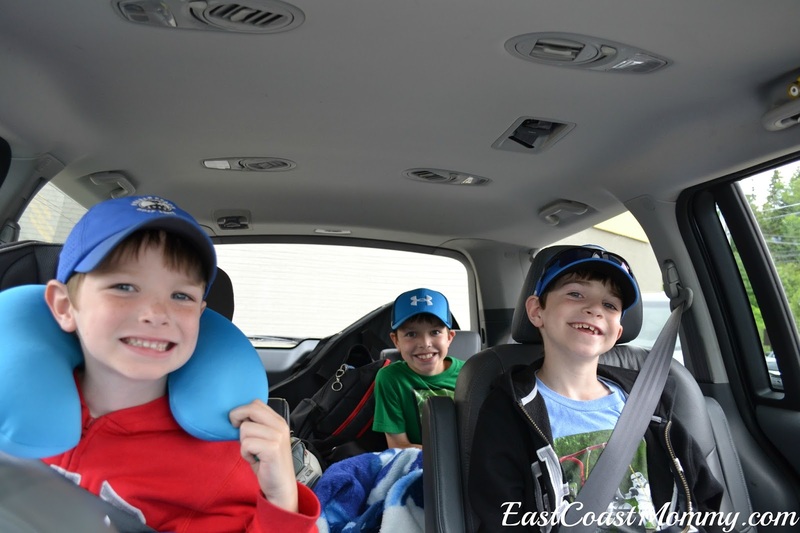 We piled into our mini van, and we drove 1,454 kilometers. As the mother of three very active boys, I was pretty nervous about undertaking this adventure; however, our road trip turned out to a lot of fun. Today, I am sharing some road trip survival tips that really worked for us. 1) Print out a map of the route and set expectations. Let the kids know it is going to be a long drive, ban the question "Are we there yet? ", and give the kids frequent updates so that they can track progress on the map. 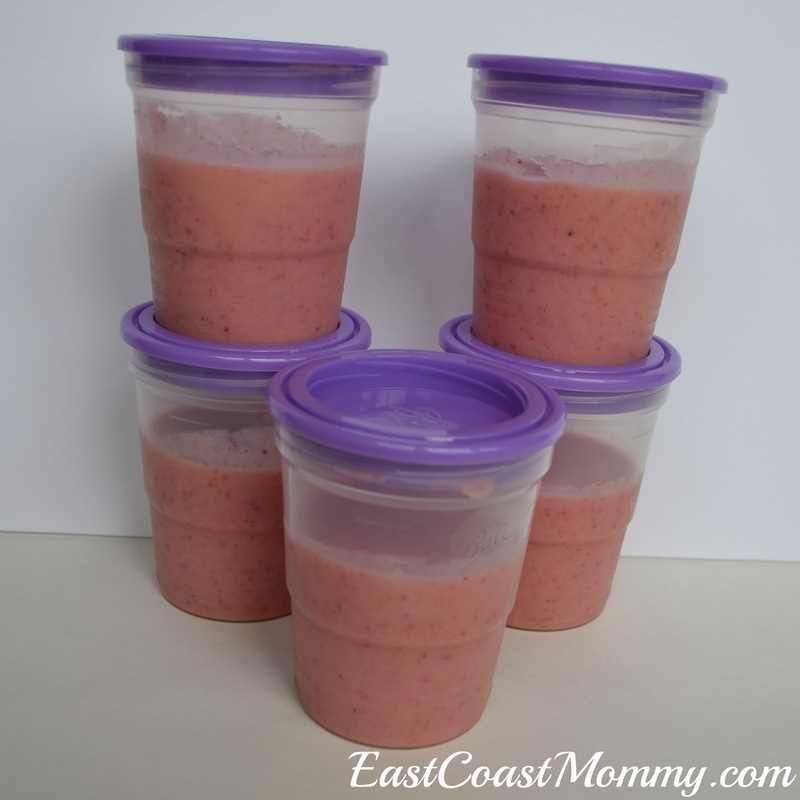 2) Make the kids comfortable, hydrated and well fed. The kids should be dressed in comfy clothes and surrounded by pillows and blankets. A bin with lots of water and snacks should also be easily accessible. Snack packs are fun too. Check out all the details here. 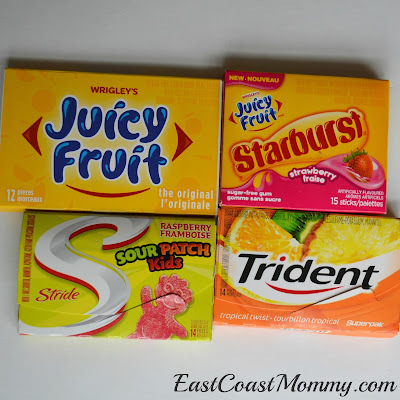 3) Wrap a box full of trinkets and treats. When the kids need a distraction, they can unwrap one of the presents (which can include books, treats, games, glow sticks, activity books, silly putty, and gum). Gum is great for stretching out the time between snacks. 4) Play car games. Search the internet for road trip game ideas. 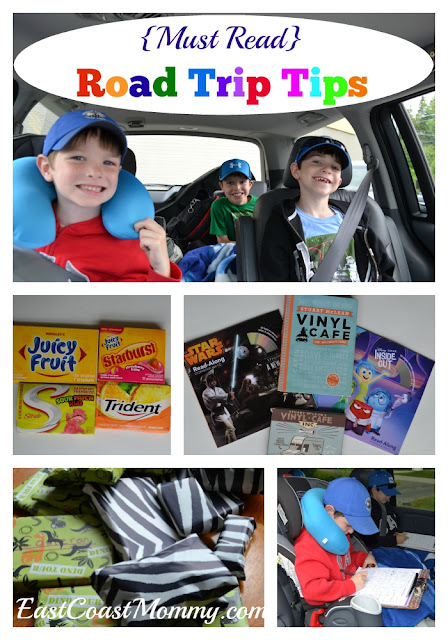 My boys loved a road trip scavenger hunt that I printed out for them. 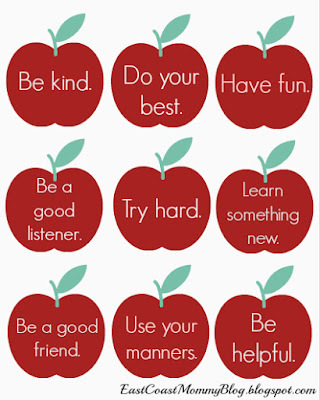 5) Play music, listen to audio books, and watch movies. When it comes to boredom busting, electronics can be your best friend. Audio books (which are available at the library) are a fantastic idea because they can entertain the kids AND the driver. 6) Make the road trip part of the vacation. There is no need to make a long drive pure torture. If the kids need a break, stop. A five minute break to run around and stretch will make a road trip much more enjoyable. There are also many interesting sites along highways. e.g. 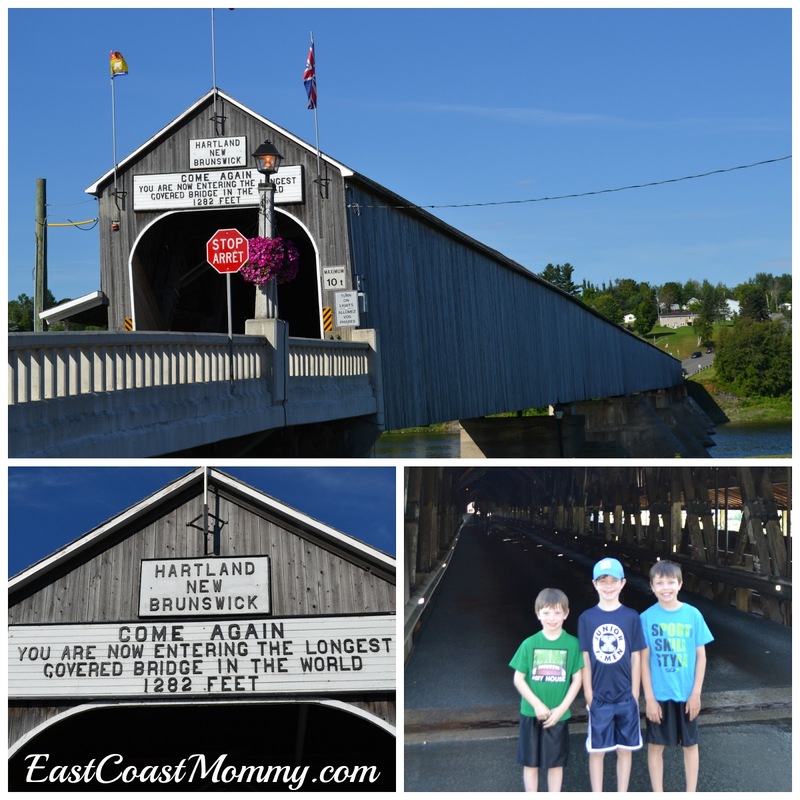 We made a quick stop at the "world's largest covered bridge", and we were glad we did. I have heard that some people have had success with driving all night, but my boys are not good at sleeping in a car, so I ruled out this option for us. I also feel that getting to a destination with well-rested kids and exhausted parents sounds like a bit of a nightmare. I am really pleased with how our road trip adventure unfolded, and I would definitely do it again. 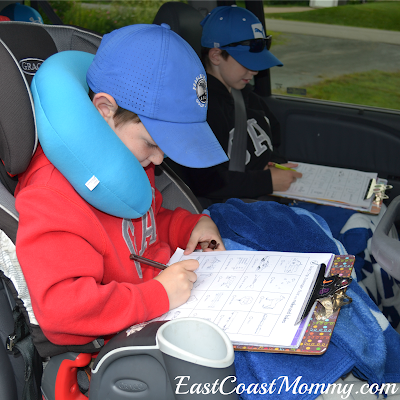 With a little prep, road trips can be a positive experience and a fantastic way to create childhood memories. Recently, my family inherited an RV that had been owned by a couple (rather than a family). 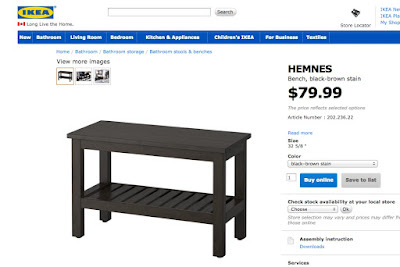 The previous owners removed the table and chairs, which made it difficult for our family to have meals and play games. 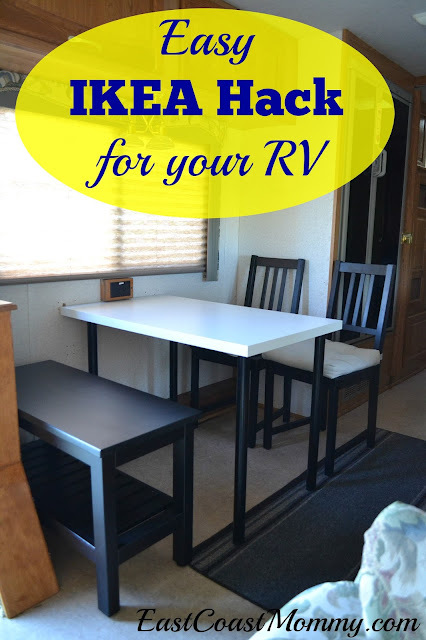 So, to solve this problem, my husband and I came up with an easy and inexpensive IKEA hack for our RV. 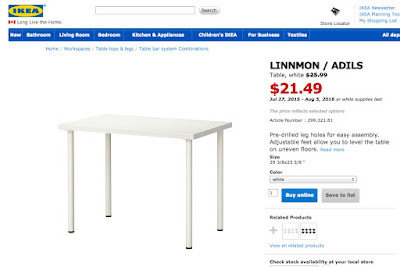 For the table, we used the Linnmon desk. 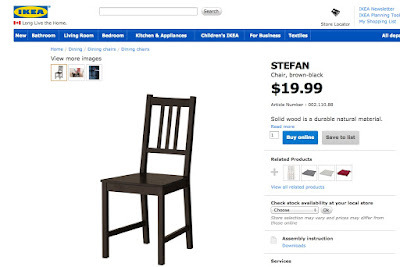 We also purchased two Stefan chairs. And to finish off our set, we purchased a Hemnes bench. Now we have a perfect place for our boys and their cousins to eat breakfast, and a fun place to play cards (as a family) on rainy days. 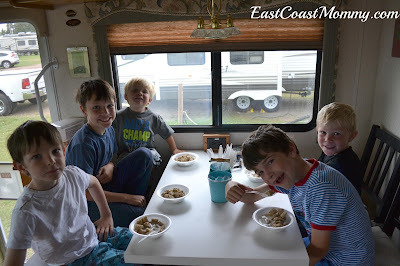 Does your family have an RV? Have you made any modifcations to it? I'd love to hear about your RV upgrades and IKEA hacks! I love a good "theme", and a circus theme is one of my favorites. Recently, I had a fantastic time making some circus crafts and playing dress up with a group of children. 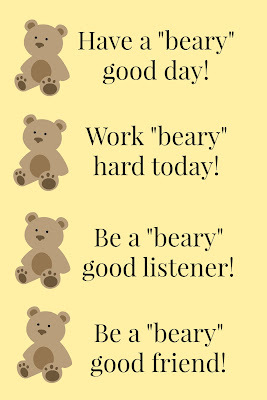 Today I am sharing the free tutorials and printable templates. One of my favorite circus crafts is this clown puppet that I designed. 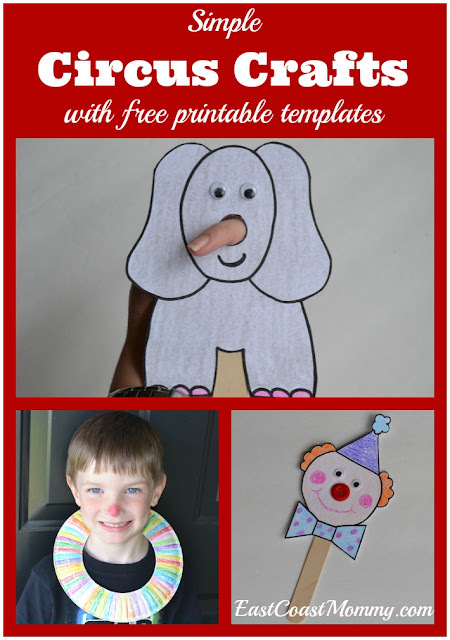 Just print the template (you can find here) onto cardstock, color the clown, cut it out, add some googly eyes and a button nose (with glue), and tape a craft stick to the back. Isn't it adorable? 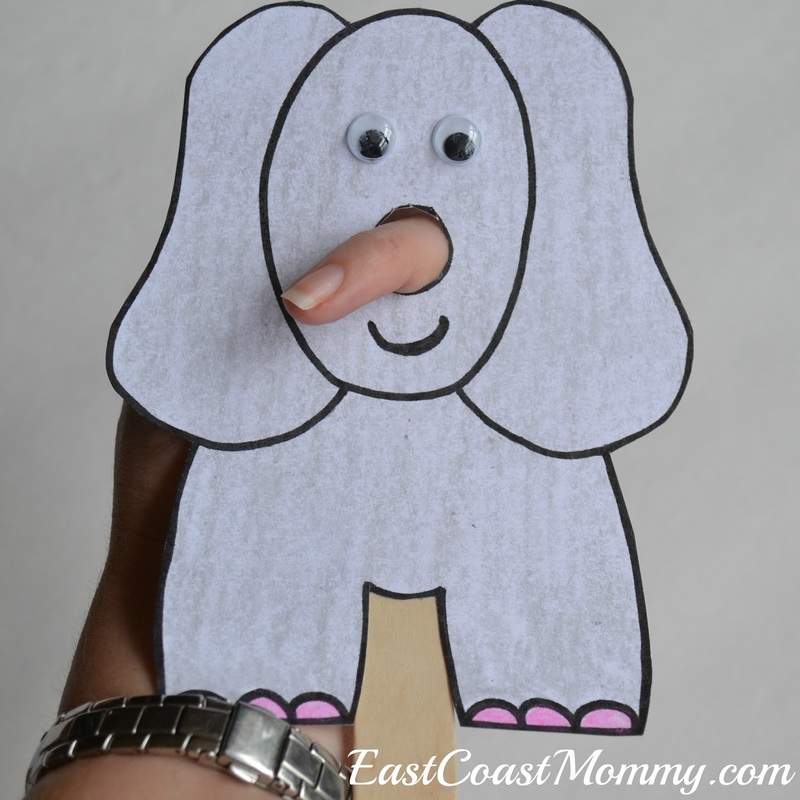 I also designed an adorable elephant puppet. 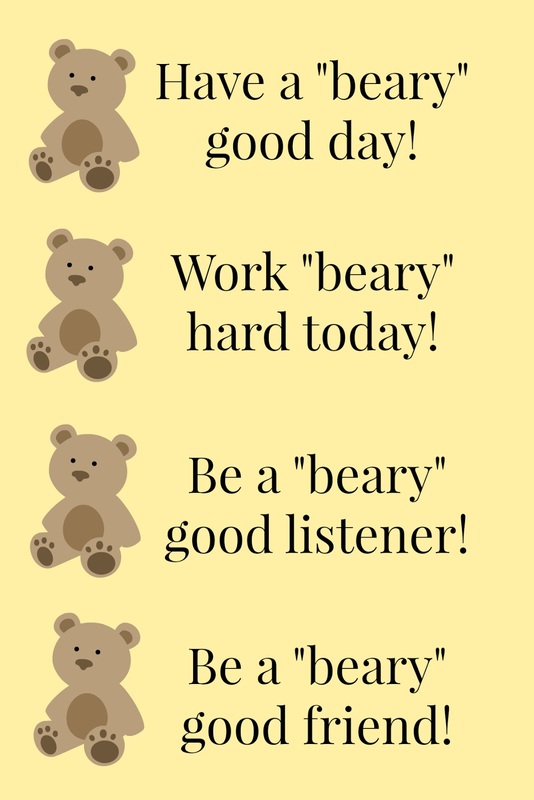 Just print the template (that you can find here) onto cardstock, cut it out (including a hole for the nose), glue on some googly eyes, and tape a craft stick to the backs. The ability for the child to use his or her finger as a trunk makes this circus craft extra special! 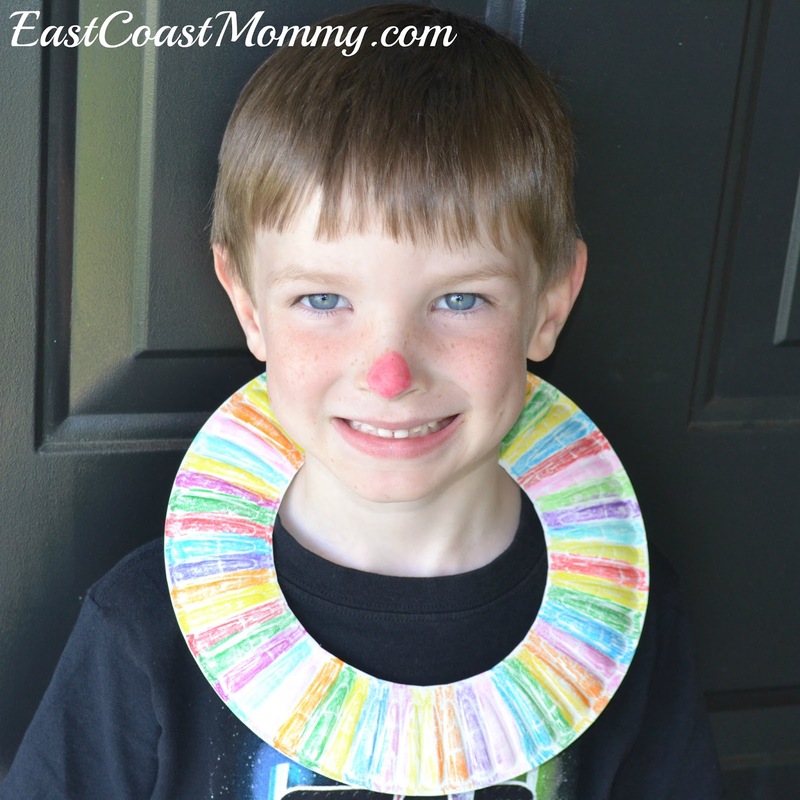 It's also easy to transform little ones into clowns with simple paper plate clown collars. All you need to do is: cut the centre out of a paper plate, color it, and cut a slit in the back. I love how easy and inexpensive this craft is, and I guarantee your little ones will love it too! These circus crafts are perfect for an afternoon of crafting, but they would be wonderful activities for a circus party too! 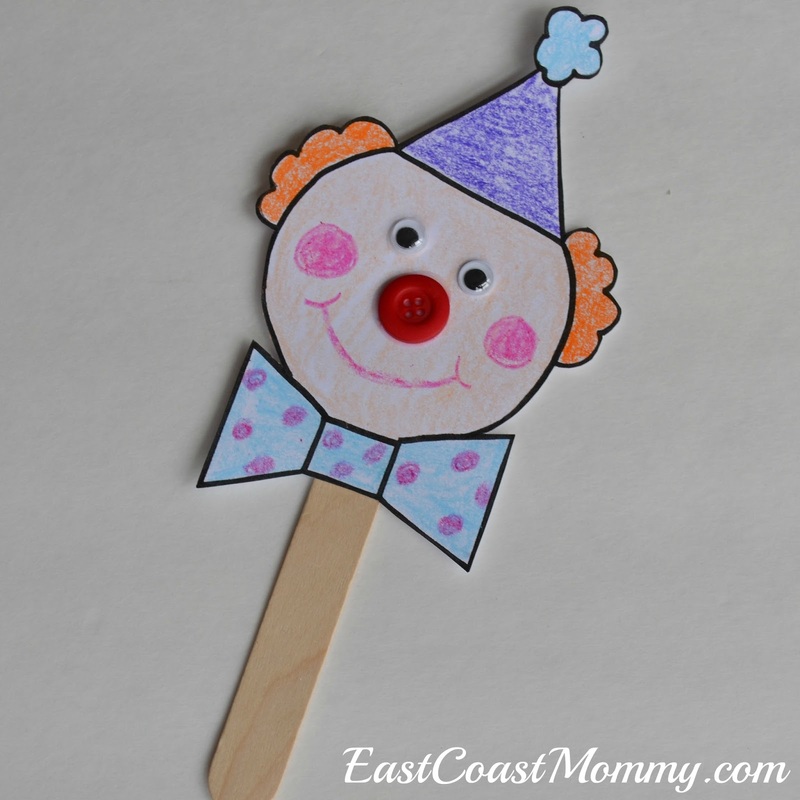 I hope you and your little ones enjoy making these fun circus crafts as much as we did. 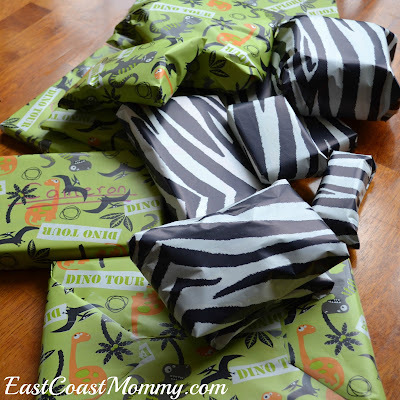 Please note: East Coast Mommy printables are free for personal, non-commercial use only. If you are pinning or sharing this post, please share from this page only and not the direct download. Thank you!